This adorable craft was actually developed by the lady who used to teach my preschool class before me. It's one of my favorites! I did change it up a little. 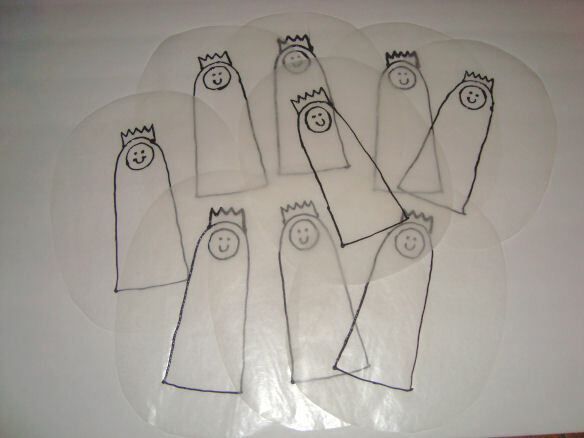 Start by drawing a very simple picture of Mary with a crown. I wanted to provide this for you, but I'm having scanner issues. Trust me- you can do this! 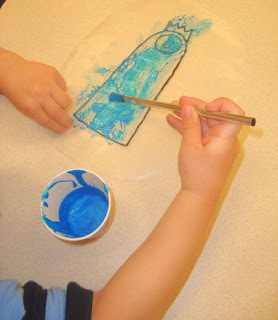 When you have your sketch, tear off a piece of wax paper and lay it on top. Trace around your simple lines with black fabric paint. *I have read that you can open up some white glue and add a little black paint to it in substitution for fabric paint, but I haven't tried it. Let this dry. (These only took me about a minute each to outline once I had my sketch). 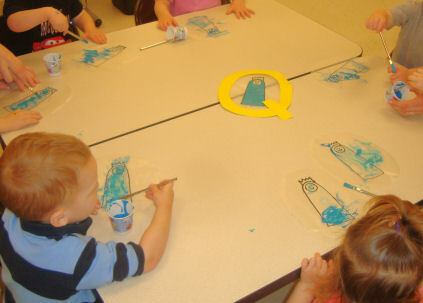 When it's dry, have the children paint in Mary with blue stained glass paint. **If you'd like to save yourself some money and a trip to the craft store, you can substitute this for a paint/glue mixture. 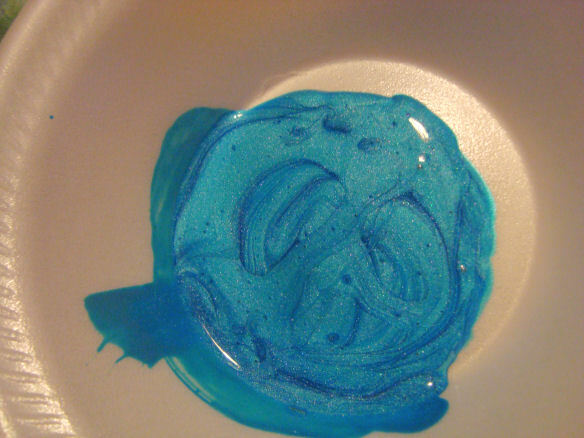 This mixture needs to have more paint than glue. It's not quite as nice as the stained glass paint, but it works in a pinch (and it's what we used for ours). 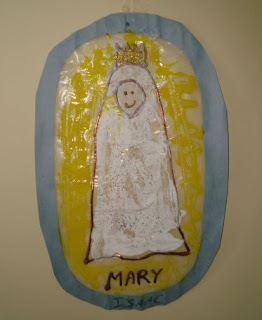 After they paint all over their wax paper, you can wipe off the paint around Mary's dress and in her face with a paper towel. Then have them squirt gold glitter glue into Mary's crown. Again, you can wipe with paper towel if they make a mess. 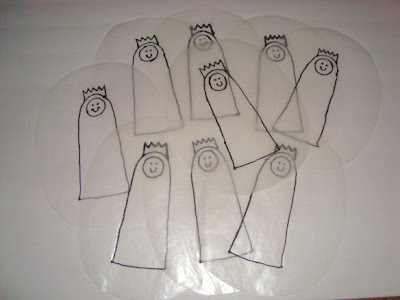 Cut out a paper frame for your Mary and glue it on around the edge of the wax paper. We used colored poster board, but construction paper is just as good. 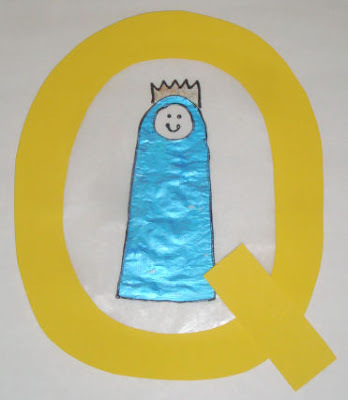 We then glued on a scrap of our paper to make the frame a Q since "Q is for Queenship of Mary". I like these ones with the stars, but it's very time consuming to draw them all with the fabric paint, so I skipped them. 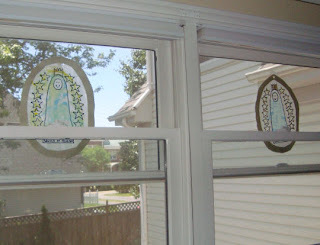 They really do look really cute hanging up in the window! Check out this post for an alternate Queenship of Mary Craft. Grab Bag Ideas for the Letter Q: (be sure to check out the Classroom Script for directions on using the grab bag.) 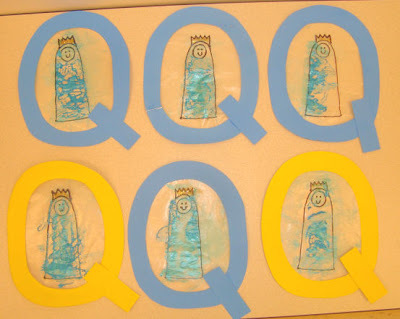 Quilt (or quilted toilet paper), Quarts crystal, Q-tips, Quarter, Football player (Quarterback), Bee toy (for Queen bee), Quail, Quill (take any feather, cut the end off, and scribble on it with a sharpie), Queen, Quaker oatmeal. Catholic ABC's runs here at Catholic Icing every Wednesday (except for today when it ran on Tuesday) with the new letter of the week. You can find the details of the program here.